Short, less than 30cm tall, this specimen barely 7cm, and with runners. Said to avoid acid soils, but this was growing on the banks of the R. Duddon beyond Seathwaite. 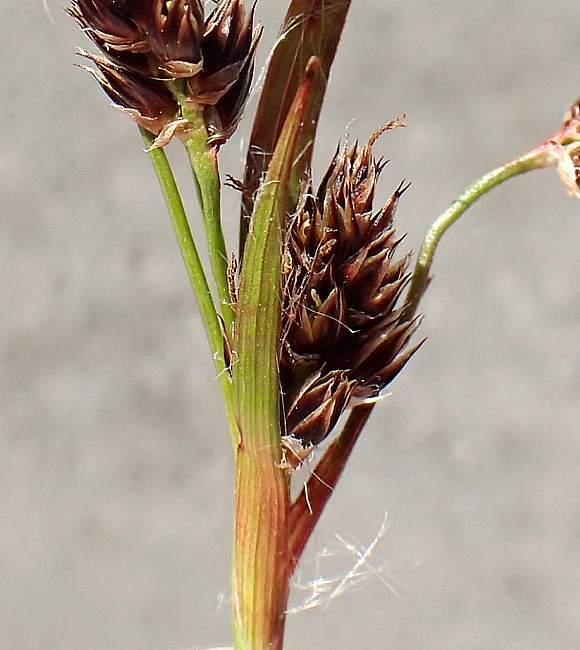 Heads light-brown with conspicuous bright-yellow anthers, which are much longer than their stalks. 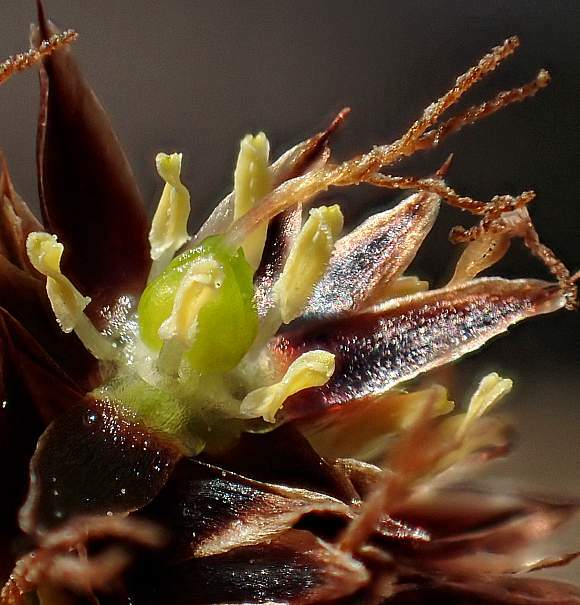 Each flower has six anthers and six brown tepals. Ovary green at first. 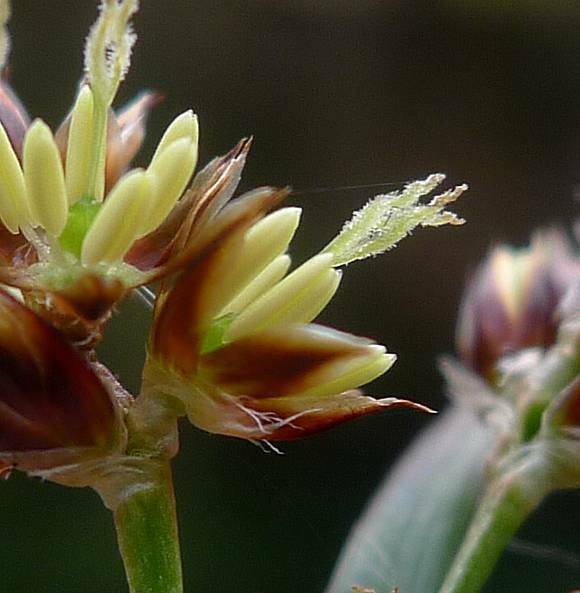 Stigmas are longer than stamens and have three twisted fuzzy 'threads' projecting out. Leaves have a stringy pith and hairs. The brown fruits (visibly protruding lower left). Green ovary in centre biding its time to ripen to brown. Styles and anthers doing the twist, like they did last Summer. Congested Wood-rush (Luzula congesta) but that has the flowers much closer together and is taller and without runners. 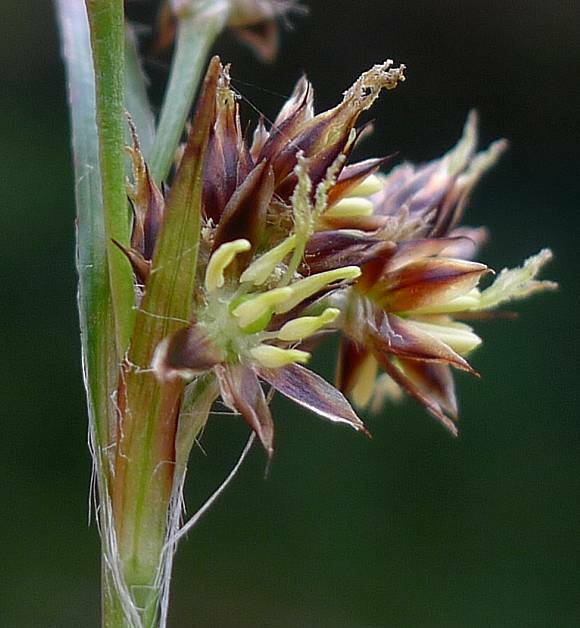 Spiked Wood-rush (Luzula spicata) but that has flowers in an elongated spike inhabiting rocky and stony places on mountains in Scotland only. 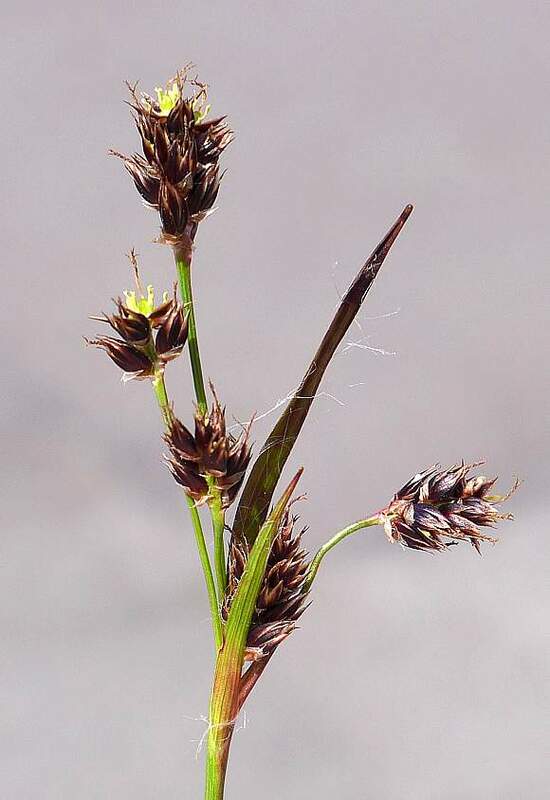 Heath Wood-rush (Luzula multiflora) which has three sub-species and is not un-like Congested Wood-rush (Luzula congesta). Great Wood-Rush (Luzula sylvatica) but that is much taller at up to 80 cm. 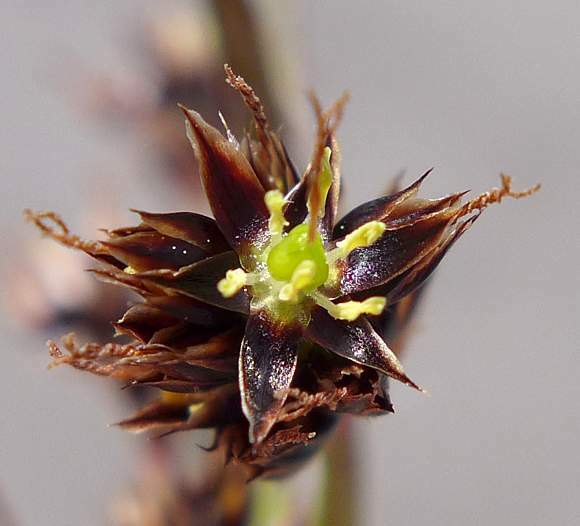 Hairy Wood-Rush (Luzula pilosa) but that has a forking cluster of very long stalks with a flower at each termination. 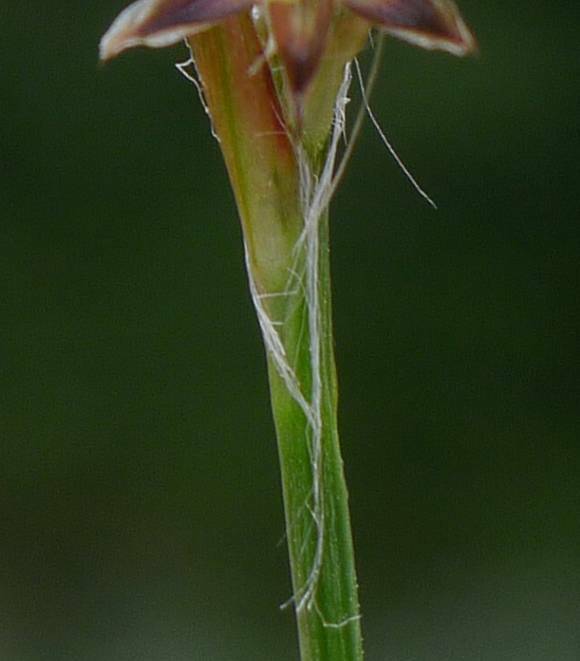 Southern Wood-rush (Luzula forsteri) but that is only in the southern quarter of the UK. White Wood-rush (Luzula luzuloides) but that has off-white flowers. Snow-white Wood-Rush (Luzula nivea) but that has pure white flowers. Fen Wood-rush (Luzula pallescense) but that is very rare found in only one or two hectads in the Fens area of Huntungdon and has only four (rather than six) tepals under each flower. 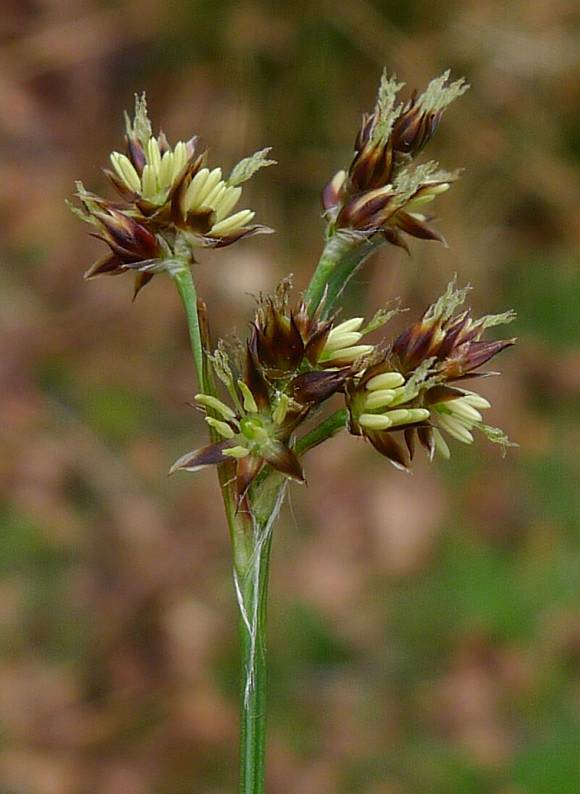 All of which, like Field Wood-rush are tufted and have leaves with long white hairs. HEIGHT: Field - rarely exceeds 15cm. Heath - taller 20 to 40cm. 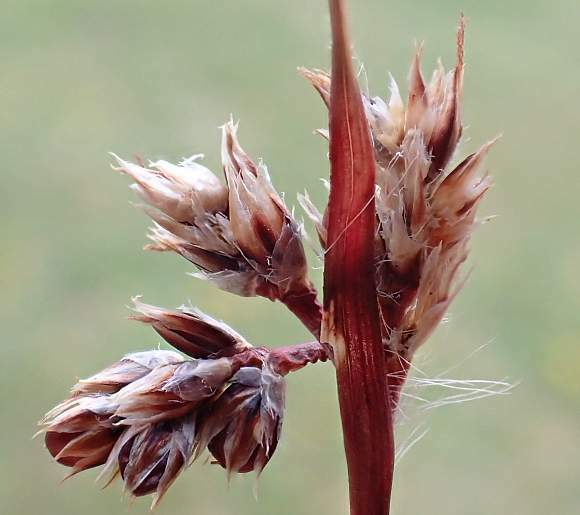 PANICLE: Field - one stalkless, 3 to 6 branches stalked. Heath - almost umbel-like, up to 10 branches. 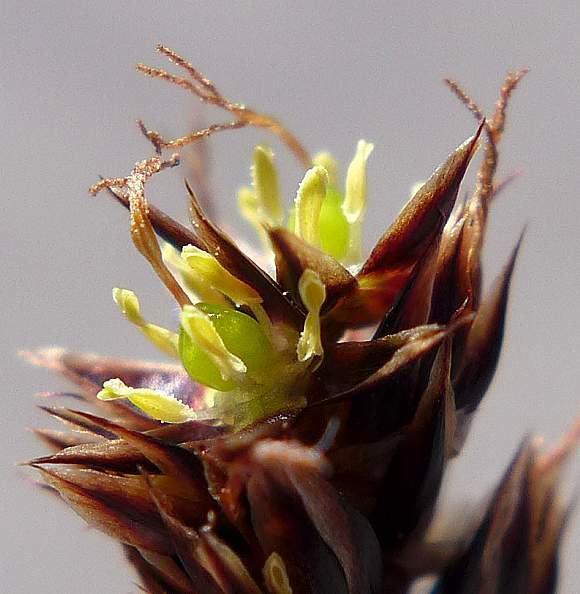 HEADS: Field - globose to ovoidal, on slender branches curved in flower. Heath - ovoidal to oblong, on slender branches. FLORETS PER HEAD: Field - 3 to 12. Heath - 8 to 16. 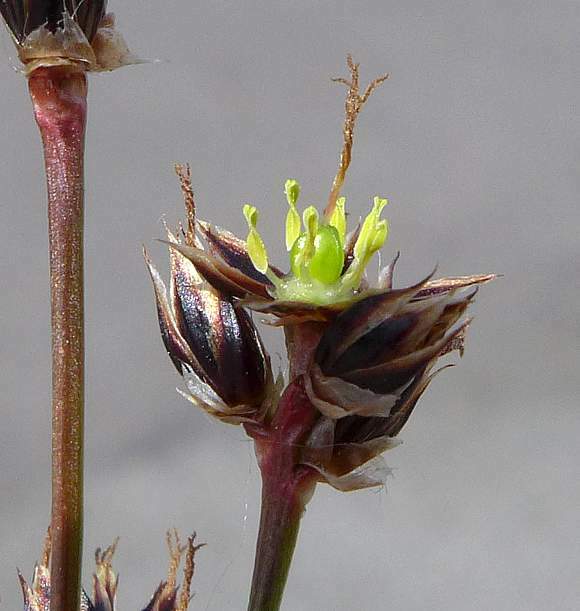 PERIANTH (TEPALS): Field - 3 to 4mm long, finely pointed, longer than the fruit capsule. 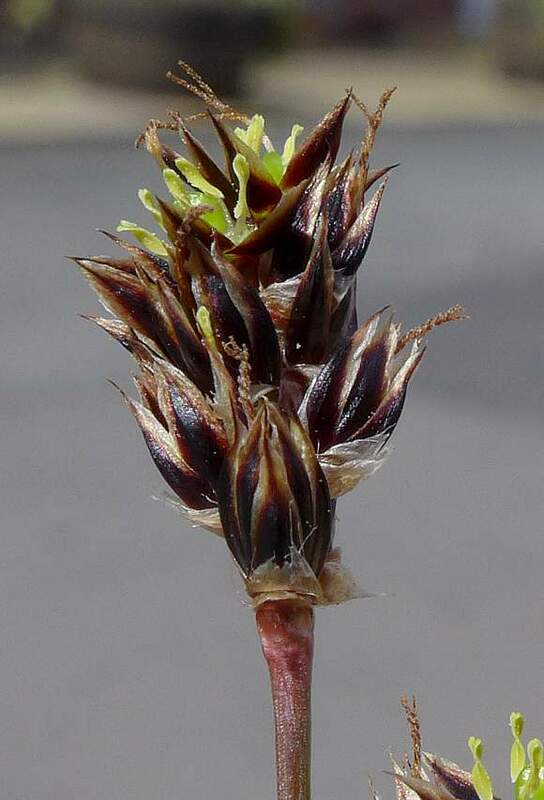 Heath - 2.5 to 3.0mm long, paler-brown, broader based, equal in height to fruit capsule. FRUIT CAPSULE: Field - 2.5 to 3mm long, obovoid, rounded top but with a point. Heath - nearly spherical, paler brown, but a similar point at top. ANTHERS: Field - bright yellow, conspicuous when flowering, 2 to 6 times longer than their stalks. Heath - about as long as their stalks. SEEDS: Field - globose. Heath - oblong. 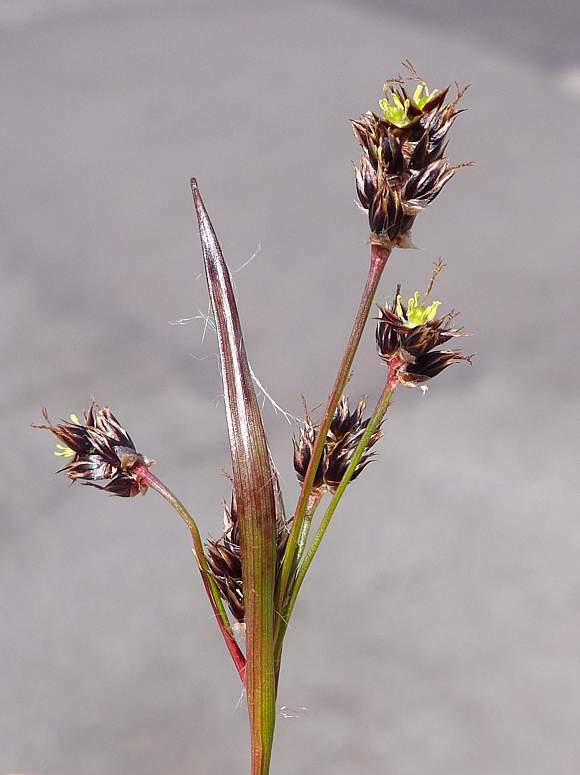 No relation to : Flowering-Rush nor to Woodruff [plants with similar names]. According to one source, it avoids acidic soils, but that seems to be exactly where it is growing. 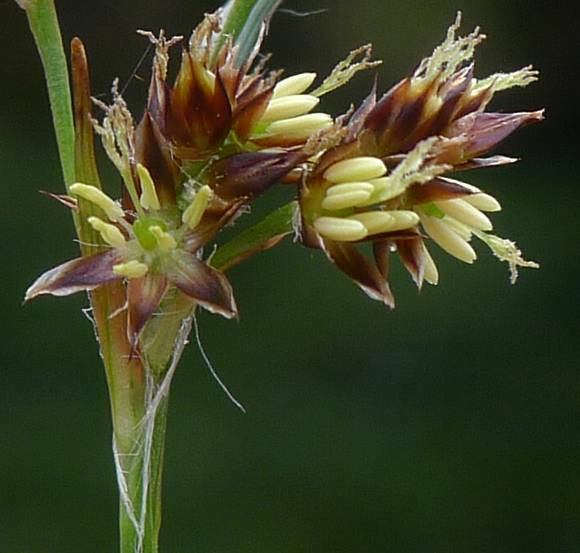 There is always the possibility that the above specimen is that of Heath Wood-rush (Luzula multiflora), but that flowers from May to June; the above photos were taken on 20th April.